Could Walnut Hills have a grocery store as early as this year? For two years, Walnut Hills has been a food desert. That forces some in the community without transportation to either take time-consuming bus rides to a store in another neighborhood or pay high prices at convenience stores. CINCINNATI — For two years, Walnut Hills has been a food desert. "At the time that I was hired, Kroger announced that they were leaving," said Gary Dangel, who is the Walnut Hills Redevelopment Foundation's food access coordinator. Kroger's closure of the Walnut Hills store in 2017 created a major gap in food accessibility for the neighborhood. The nearest store is now in Corryville, more than a mile away. Dangel said that forces some in the community without transportation to either take time-consuming bus rides to a store in another neighborhood or pay high prices at convenience stores. "You're paying a high amount of money for maybe something that's not as nutritionally dense, or as tasty or as healthy as you would like to prepare for your family," Dangel said. The Rev. 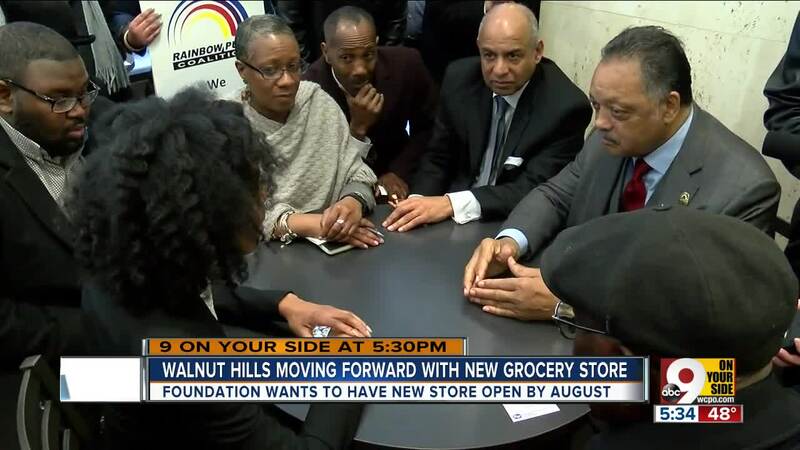 Jesse Jackson came to Cincinnati last year to protest and suggest a boycott of local Kroger stores. Kroger representatives said the Walnut Hills store lost nearly $5 million during it last six years in operation. The community has looked at a number of options to try to bring quality grocery shopping back to Walnut Hills, according to Emily Ahouse, executive director for the Walnut Hills Redevelopment Foundation. "We have explored everything from bringing 10 different operators, you know, the meat, the coffee shop, baker, the deli all together in one space like the former Kroger building," she said. "We couldn't make it happen at this time." The foundation has settled on another idea that they hope will create a grocery store option quickly. They are accepting proposals for a grocery operator until March 31, 2019. "We want people to come with innovative idea," Dangel said. "This is not going to be a traditional grocery store." The foundation will use a $250,000 grant to get the grocery store started. That means they will start small. The store will be between 700 and 4,000 square feet. They expect to select an operator by the end of April. The approach is different from other community grocery stores that have opened or tried to open around Cincinnati. "We wanted to find the grocery operator first before we determine what building," Dangel said. The operator will select the location. Dangel said they don't want to pick a place that the operator doesn't like. However, the foundation does have some possible locations in mind and has been working with a developer to make sure they are viable. Meanwhile, opening day for the new grocery store option could be sooner than you'd expect. "By August of 2019, we will have a small grocery store open in Walnut Hills," Dangel said. "We certainly have an ambitious deadline," Ahouse said. "That's part of the reason why we know we need to start small." She said the plan is to grow the grocery store slowly. She said they looked at a lot of options and ideas, including trying to revitalize the former Kroger building on East McMillan. "We've spent a lot of time trying to make that happen and we realize that's not where we are right now," Ahouse said. Meanwhile, not everyone supports the approach of the neighborhood community development corporation. "I don't think a one stop shop can sustain itself," said Clarence Taylor, president of the Walnut Hills Area Council. "I'm a proponent of seeing many shops where people can go. Not just one independent shop." His suggests having small butchers, fisheries and produce stores. Ahouse said their approach is to start small and sustainably. "Starting small is our best option to actually be able to do something," she said.